Two weeks ago, everyone around the world celebrated Holi, also known as the “Festival of Colours”. Holi celebrated the love between Radha and Krishna. Krishna always envied Radha’s fair skin and would always complain to his mother about his dark skin. To ease her son’s envy, Yashoda (Krishna’s mother) asked him to take any colour and paint Radha’s face to make her skin look like his. Hence, the custom of playing with coloured powder and coloured water on Holi began! 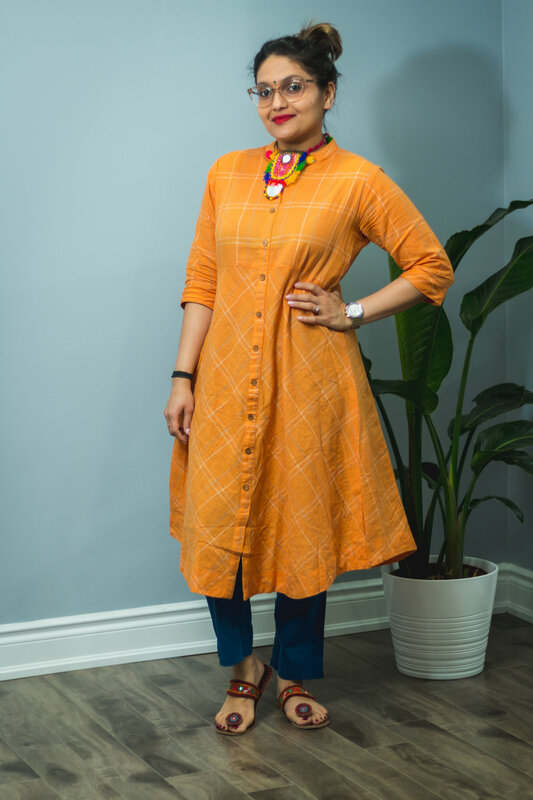 My mom recently got me this orange kurti from RayEthnic in Vadodara, Gujarat which I have paired with 3 different bottoms. In India, the colour orange/saffron symbolizes fire that brings light and burns ignorance. Look #1: Paired with a white semi-palazzo pants. Photo by: SLR Infinity. Look #2: Paired with informal jeans. I would wear this look to college/any informal events. Photo by: SLR Infinity. Wishing everyone a lovely spring-season! May you blossom with the flowers and shower love with the spring rain!